Before Tricia was activated this week, I was planning on going home to the OBX this weekend for about 24 hours for the first time in over two months. Beyond wanting to see friends and family, I was also invited to share our story from the perspective of God's Provision in a 4-minute cliff notes version tonight at our local Creative Choices Pregnancy Center's annual banquet. There will be a few others speaking tonight, as well. When I found out a few days ago that Tricia was projected to be activated by the end of the week, I decided not to go...but I still wanted to share our story via video. I had just a few hours to write my thoughts down, shoot the video below, and edit, so it's not as perfect as I'd like it to be, but I think it's not too bad. Anyway, they'll be showing the following two videos tonight. I'm praying that these videos will help people understand and appreciate adoption, premature babies and God a little more. We're praying that many will be reached tonite and touched by what you have to say Nathan. Beautifully done. Great idea to still make a statement even though you couldn't attend. I've continually been impressed by your and Tricia's decision to continue your pregnancy against great odds. Thank you for standing for life, making a bold statement, and trusting in the Lord to see you through whatever the outcome. Very nice! I was touched by your words. Praying for your small family. Beautiful! What an amazing job you have done and what great love you have for your girls and they for you. In the pictures you have shown of you two together it is evident the profound love you have for one another and I feel blessed to have been a witness if just by the internet. Best wishes to you and God Bless you all. Beautiful video, I am speachless. I have been listed as an organ donor since my daughter was killed in an accident, in 1983. Unfortunately, due to the circumstances, we were unable to donate her organs, however I decided at that time that I would become one. May God continue to bless you as you continue on the road ahead. I have been following your story for about 2 months now. I have never posted anything, but have been wondering something. Will you eventually take all these blogs and make a book out of them and have the proceeds go to CF? Anyways just thinking of you and your family take care and God bless! Powerful Nate! Are they going to show your video? I hope so!! As usual...the video picture slide of babay Rose is just beyond words. I can't watch and not tear up thinking of the great power in God's plans for us all. She is a awsome testament to her Mother's love of her and God. And the power of prayer. Thank you very much for sharing this all with us Nate! It is a real giving of yourself to allow us all in like this. To witness this awesome display of God working in the lives of your family in such a powerful way. Your words are a Blessing that I pray will reach many many people. Wonderful! I too adopted my baby girl and she is, without a doubt, the greatest gift from God. I hope your story helps to reach those with a hard decision. It was very touching to hear your story with your own voice instead of reading about it. You did a great job and I will pray that your story touches many tonight! Nicely done on both video's, Nathan! Praying that many will be reached tonight by them and the other speakers! That was absolutely beautiful, and brought me to tears. I too am praying that those in congregation tonight will be moved by the Holy Spirit. God does indeed work in mysterious ways but I've learned in my life that if He brings you to it, He will bring you through it. Continue to put your trust in him and things will work out as they should. I will continue to pray for your beautiful family! Take Care! After reading your blog for the past month,this says it all.Thanks for an even better understanding of your life with Tricia and Gwenyth. how many times can I say beautiful on your blog without sounding redundant!?! If only one...! My prayers are with those attending tonight. Great job Nate! I hope everyone that attends is as touched by your story as we are. It's wonderful of you to share you miracle girls with so many. What a powerful message to show the love of a parent and God's wonderful plan! What an awesomely incredible testimony this is. I cried all the way through these videos, and continue to be totally amazed at what God is doing in your lives. May He bless and keep all of you, and continue to use you mightily for Him. I've been keeping up with your blog ever since your prayer request in December on the Frequency and yet seeing and hearing you share your story on the video still moves me. You did a great job with the video and I'm sure it will move others as well. God bless you, Tricia, and your precious White Rose as you continue on this journey together! It's hard to hold back the tears. These were beautiful. I LOVE the last pic where you can see both your faces behind Gwyneth's little head. Sorry to post this as a comment, but I guess it is fitting to this post. I wanted to email you, but I don't know your email. You don't know me, but I read your blog regularly (as I'm sure is the case for many). I'm a college student and I am currently enrolled in a class called Human Development: Infancy through Adolescence. We are studying premature babies right now and I wanted to ask your permission to share your inspiring story with the class. Thank you, Nate. Cool video y'all. I have not kept up with all the comments, but from the sounds of some of your posts I take it y'all are hearing all kinds of unproductive things. So sorry for this, just know we check in every day and pray! Blessings to all 3 of you! Well done, Nathan!! I just hope they have plenty of Kleenex handy tonight as God touches hearts through you and Tricia's story! It's awesome that you are using your testimony to speak to others who have life-changing decisions to make. What a powerful "thanks" and "Praise" for all the Lord has done in your lives! We'll be praying that it will have a mighty impact for Him! While updating my prayer journal with the news of Tricia's transplant status last night, I came across a verse that just seemed perfect for you guys! God's timing is always amazing! Wow. I bet you never imagined such purpose would be in your life and you'd have this kind of ability to reach out to others. Absolutly Amazing. Continued love and prayers here in Louisiana!!! What a wonderful testimony of God's faithfulness and his mercy that he has given you and your family day by day. I pray for you and your family every day. I pray for God's blessings and his mercy to be on you today. I never get tired of hearing your story. I think people will benefit from it. Praying for new lungs quickly and NO FLU! Wonderful. What a great snapshot of your stories. That is so amazing. I think I will link it from my blog. Wow Nate, that was so touching. I am continually amazed by you and your girls. I have been following you story but I have never posted. You are a strong man, Nathan, and an amazing testament to what God wants a husband and father to be. And your baby girl is beautiful. But I wanted to let you know that your story has driven me to peruse my dream to be a genetic researcher and therapist. Due to your story, I want to help make the cure for cystic fibrosis actually happen. Praying for God's strength and wisdom to be with you and your family. my name is audrey and i have been following your blog for several months, but i have never commented. you and your family are in my prayers everyday. one thing i have learned over the years is Jesus is sufficient in ALL things! i love the video you posted, it was such a blessing. i wanted to let you know of a website i stumbled across. it's blurb.com you can download it for free to your computer. and you can use it to create a book about your journey with tricia and sweet little gwyneth. i am using it to make a book about my wedding. i just thought it would be a neat tangible way to look back on your memories and what the Lord has taught you. you and your family have been such a source of encouragement to my husband and i. we are a young, newly married couple serving the Lord in youth ministry and your story has been such a refreshing reminder of the power of God in our daily lives. i will continue to pray for you, your wife and your beautiful baby! * i am under my husband's account! that's why the name says ben! Your family's strength and faith in the Lord is beautiful. Thank you. Always in my prayers. I was invited to go to that tonight but could not go. I'm glad I didn't miss your videos.Beautiful. Hi, I was just wondering how did u put a Header on the top? I tried to make one, but I don't really know how. Can u show me? Thanks! Nice presentation by you--I think it will make an effective impact on the participants tonight. I've been touched by the "miracle video" before and left in tears but this time it left me with a profound sense of peace that God is present everywhere and He is in control. Your video is beautiful and amazing. God is doing such wonderful work, through your family. I am writing through tears of excitement, anxiousness, and happiness for you and your girls. Hi- Just a quick response to your thoughts on organ donation. My little brother was killed just over a year ago in a freak drowning accident. He was an organ donor. At his funeral we passed out bracelets promoting organ donation. Of course we ache every day with the pain of his death. But at the same time we rejoice in the life he was able to give to many others. It's a strange paradox. I'm praying for your precious wife and daughter. And you too. Amazing! So wonderful to hear you tell your story in a vocal way. I continue to pray, as God carries on with His miracle and perfect plan for your lives. It's incredible to see how much hair she has!! =) Praise the Lord for giving you this opportunity to share. Great Job Nate! The faithfulness and grace of the Father is evident in your words. I am praying that many tonight will be impacted by your faith in the Sovereign God who knows all and wants the best for His chldren. You are a true inspiration, Nate. How proud I would be to have you for a son. It is obvious that God is sitting on your shoulder as well as Tricia's and your gorgeous baby girl's. Look at all her blonde hair. Please know that "we" are watching and praying from afar. You did an incredible job! I'm sure your love, compassion and obedience to God will touch the hearts of many! Very extremely well said. You covered the bases and got a home run. All the glory goes to God. It has and is amazing to watch the final formation of Gwyneth. She is starting to have features like you and Tricia. (hopefully beauty from her LOLOL) Just kidding. YOu are both beautiful. Thanks for sharing that. I hope it touches many. God knows we really need to see lives touched and changed. Still saying prayers. What a beautiful testimony of God's grace. I to will pray that many will be touched by your testimony in this area of your life. May God bless you and your precious family. we pray that your story will touch many tonight! your two videos were amazing! i am glad you are able to recognize the glory of God through all this and share about His mercy to others. Awesome! Truly a miracle! Continuing to pray for all of you. Nate - Its amazing to watch God work through you, and how you use your gifts and talents to reach others. I'm continually amazed day after day of your family's journey and faith. Truly inspiring! It is great to hear your voice after "hearing" it so often on your post. Still banging on the gates of heaven on your family's behalf. You never fail to bring me to tears! All three of you are so strong! God Bless! You couldn't have found a more perfectly fitting song for the 2nd video with all the pictures of Gwyneth. She is truly a miracle! Reading about all that has gone on and then actually hearing you say it just makes it set a little deeper. Glad to hear that both the girls are doing well! Jeremiah 29:11... "For I know the plans I have for you, declares the Lord. Plans to prosper you and not to harm you, plans to give you hope and a future." Though we may never meet here on earth, Nathan, I look forward to knowing you and your family in Heaven someday. God shines through you, my Brother in Christ. Nate, both of these videos are just amazing. Great job. The Hands on a Miracle video is my favorite. Who can deny God when they see that, yet we know that many still do. I continue to pray for you all each and every day. May He continue to pour His blessings out on your family. Thank you again for allowing us the privilege to share in your story. WOW!!!! Amazing. What an incredible journey. Praise GOD! Are you okay with us playing these videos for our church and/or youth group & youth small groups? I never focused before your video about how so much of Tricia's entire story has been about choices. Thanks be to God for every single one of the trusting choices that have been made. Both your girls are beautiful and your video will say so much - simply but powerfully. Beautiful...... I have no other words. That was GREAT!!! We are praying for you and your girls, God is so good. Beautiful videos - beautiful message! I love the picture of Trisha pregnant - she looks just wonderful. Praying that your lives will continue to draw people to a relationship with Christ - the obvious source of your hope and your strength! Still praying! Wow! Powerful...and looking at Gwenyth here and the new pics, amazing how much she's grown. Still praying daily! Nate, that was good stuff. The last picture of the back of Gwyneth's head with you and Tricia looking in at her is absolutely fantastic. Misha and I were there along with Grandma Gail, and another couple of ladies at our table. The whole evening went well and the CPC did a great job with the event. The three testimonies were great and I saw quite a few tissues being used during Nate's video testimony and the baby Rose video. Nathan- Your video had a very big impact on the group at the banquet tonight. It was awesome! Hope you all have a great night's rest. I am always so amazed by your strength and love. what a beautiful post. thanks again for sharing your life and story with us all. Wow what a wonderful way you put everthing together. You are so wise beyond your years. I know it was a blessing to everyone that saw it. I hope they had kleenex out on the tables. Gwyneth will be so blessed to watch this one day. Continuing to pray that Tricia gets the her new lungs soon and that our Lord grants you peace and patience as you wait. Wow Nathan, you did a fantastic job! What a great outreach tool, I can't imagine what an impact this could make on a life! Amazing! Absolutely beautiful. To God be the Glory forever and ever AMEN!! Beautiful miracle! God is using your family in such a mighty way. We will keep praying for ya'll. You are a truly amazing person! You have been sharing so much with us in words, but watching your video has truly proven what a wonderful man, husband and father you are. I wish you, Tricia and your precious Gwyneth all of life's continued miracles. The three of you are very inspiring individuals in your own way. I continue to pray for your girls to be home with you soon. Your video was great and I hope that it helps those that need it most! So cool to hear the adoption part of your story. We brought our little girl home in Sept to learn a week after having her home that she was totally deaf in both ears. She is having cochlear implant surgery on both ears on Tuesday. Would not trade the journey for anything...adoption is a picture of God love for us. We are all ordinary people living an extrordinary life FOR an extrordinary GOD. Praying for all three of you many times during the day! Blessings on your journey as God weaves his name through your life!! Two beautiful, inspiring videos! I'll pray the Lord will continue to use your words and your testimony to draw others to Him. Wow, after my horrible night tonight, this is JUST what I needed. God is SO good! The videos are beyond words. You are really very eloquent, especially when you speak. It gave me a more personal perspective. I am so glad Tricia is activated on the transplant list! Praise God! Even though I do not comment every day, I check numerous times a day for updates, and always pray for you. I must admit that my faith is not what it should be at the present time..but your story has inspired me to fill that void in my life. Thank you for sharing your story. It has already made a HUGE difference, and I know you guys are not done making differences in the world. God bless your beautiful family. I happened onto your blog through a friend and have been praying for your girls. Thank you for sharing your story and taking a stand to trust God in all circumstances. I believe that God will use this video to impact many lives, and will pray to that end. You, Tricia, and your precious little one have been an encouragement to me. You video brought me to tears. 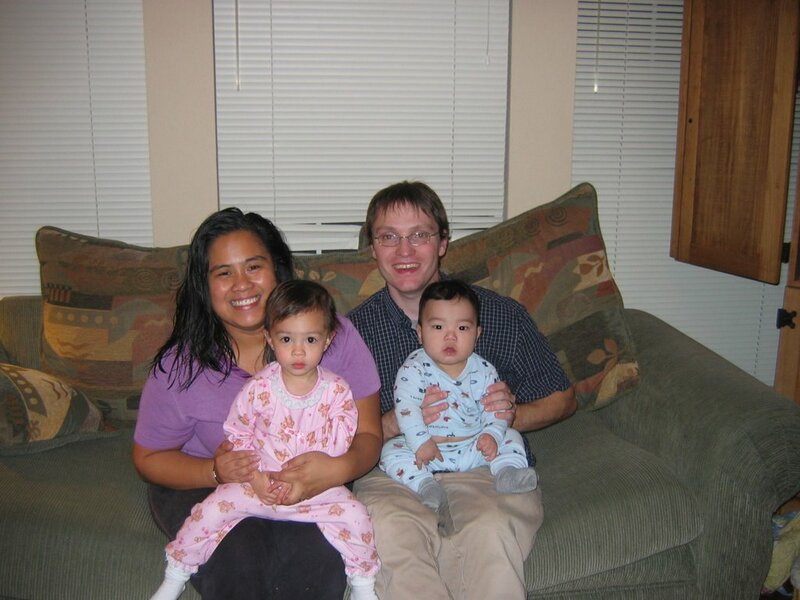 We are the VERY BLESSED parents of two children born to us via adoption from South Korea. So your video really hits home. I am so thankful there are people such as you and Tricia willing to share your experiences and story. If you touch even one person you will have made a difference and that is HUGE! Beautiful video from a beautiful family! Great video! Very professionally done for not having much time to prepare. May God continue to bless your sweet family. Prayers from Tennessee! One of your best posts ever! Your speech was incredible. You spoke from your heart. continued prayers and well wishes for your family. Awesome job on the video's Nate. I'm sure that touched all those people who attended and saw. You probably just picked up some more readers of the blog as well! Praying you guys have a great Sunday together today. Lord bless all of you. very well done. beautifully said. i was inspired anew. i never tire of watching your Hands on a Miracle video -- amazed again at Gwyneth's tiny, perfectly formed little parts. God is a such a masterful, loving creator. The video is such a great testimony....many will be touched, like I am....I never tire of hearing more of your story and seeing more of that precious baby..miracle of miracles..Thank you for always giving the glory to God..I know there must be great hurdles (that we don't even know about) to overcome during this journey, but you have allowed God to enter ALL of the pain and joy, and its a blessing to watch His plan unfold. THank you once again for honesty and authenticity and incredible courage. That was absolutely beautifully done. I am sure it will be a blessing to all who sees it. By the way, that last photo with the back of Gweneth's sweet, little head looking at your two faces was just beautiful! Your photos are all wonderful! Thanks for sharing your videos. Amazing words! The words are so touching and I know many will be touched by them. Praying for you all! I have never posted before but have been following your story for awhile. You and your wife are the most amazing and postive people. I will continue to follow your story and pray for your entire family through this journey. I hope Tricia gets her new lungs soon. My best friend has a son who is 4 yrs old and he has cf. This is how I found your story (through her). His name is Sawyer, please pray for him and his continued strengh. As of right now he is doing great. By the way the video was great and the new pics of baby are so cute. She looks alot like her dad. The last picture in the last video was brilliant! Thank you for sharing in a way that lets outsiders see it all! Once again, I'm in tears after reading your posts and viewing your pictures/videos. What an awesome God we serve! I often wonder how those without a personal relationship with Jesus can find the strength to deal with the difficulties of life. Your videos were excellent! Still praying for you and your girls and rejoicing in all that He has already done for you. Beautiful! I was very moved my your videos...thank you! What a wonderful opportunity to share your faith and your miracles. By the way, I added a link for your website to my blogsite. However, my blog is private due to the nature of it. (it is to chronicle a pending international adoption, and my child is not legally mine yet) I would be happy to invite you to view it, but I don't imagine you are willing to post your email anywhere on here for complete strangers? I did want to share your site with my friends/family, though! As a fellow CF spouse, mother of two preemies, and an adoptive parent, I think you for your words.